Three different examples of temples will be given here as a final illustration of a (semi) religious interest in the four-fold. They have a devotion to the basic elements of fire and earth in common. The first historical specimen consists of the so-called fire temples of Iran and adjacent countries (fig. 162). They are part of the old religion devoted to Zarathustra. The prophet Zarathustra (or Zoroaster) founded the major religion of the Persian Empire around the sixth century BC. Fire (light) was seen as a symbol of Ahura Mazda (Ohrmad), the Supreme Being. The creator of heaven was permanently fighting with Ahriman, the destructive spirit of darkness. Many dual concepts – like Heaven and Hell, the future resurrection of the body, and the Last Judgement – were borrowed from Zoroastrianism by Judaism, Christianity and Islam (BOYCE, 1979). Fig. 162 – These two Achaemenian fire altars at the necropolis of Naqsh-i-Rustam near Persepolis (Iran) represent a distinct type of tetradic architecture, which occurs in a wide area where the prophet Zarathustra was followed. Nearby this place are rock reliefs and the large cruciform tombs of Xerxes I, Darius I and II, dating between 550 and 400 BC. Fire is a primary element and played an important role in the religious beliefs of the Zoroastrians. The mysterious tower of Kabeh-e Zarthusht (Cube of Zoroaster), which is part of the complex, was also constructed for the light of the sacred fire. The Imperial Academy of Science in Saint Petersburg decided in 1880 to develop a program of archaeological excavations in the same way as the English and French archaeologists were working in the Near East and Iran. Nikolai Marr (1865 – 1934), born in the Georgian town of Kutaisi from a Scottish father and a Georgian mother, went to the Armenian city of Ani during the summer of 1892 and made a promising start. The second expedition was a year later. They found a wall, protecting the old city. Arà ZARIAN gave – in an undated internet article (in English and Italian) – an exploratory survey and classification of the Armenian medieval architecture. The second phase of the excavations at Ani took place between 1904 and 1917, and it was during the eighth expedition in 1909 that a fire temple was discovered (fig. 163). The four columned structure, dating from the early first to the middle of the fourth century AD, was later transformed into a church. It could well be that the fire temple, with its domed square on four pillars, inspired the centrally planned, domed church that is so typical of the later Christian-Armenian architecture. Fig. 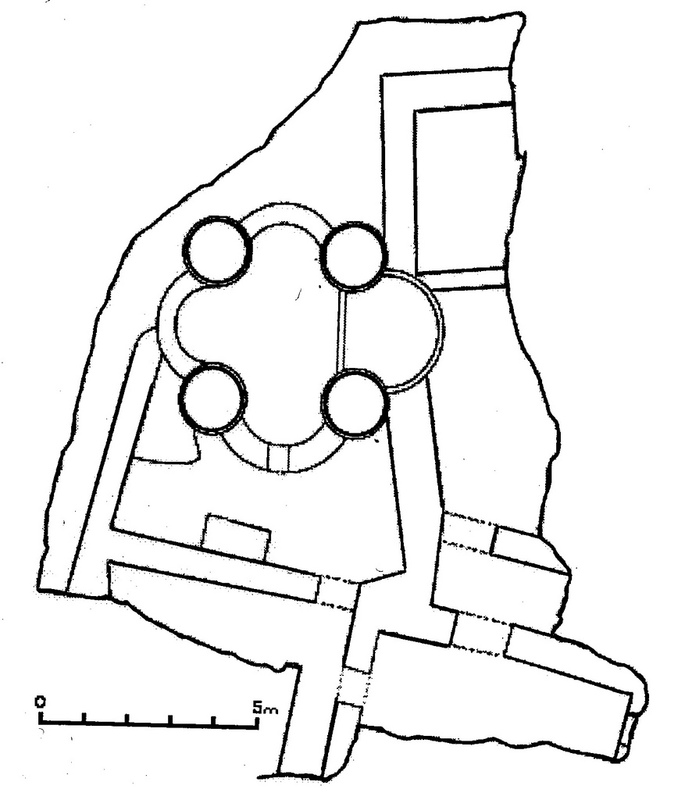 163 – A map of the fire temple in the city of Ani, which was excavated in the 1909 season by the controversial linguist and archaeologist Nikolai Marr. The Turkish troops looted and smashed the place in the years after the First World War in order to destroy the Armenian heritage and its associated nationalism. A re-excavation took place between 1998-1999 by Turkish archaeologists. 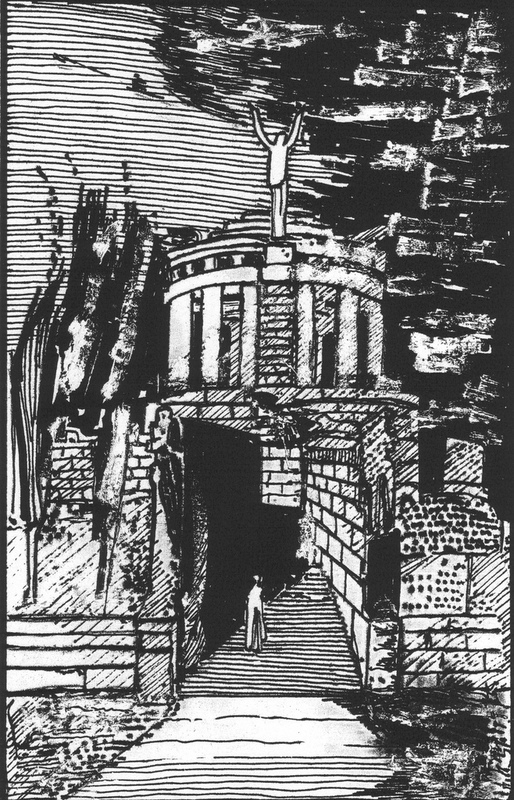 Another temple devoted to an element in a complete different time and place is the ‘Temple of the Earth’ as envisaged by the German artist Hugo Hoepner (1868 – 1948), also known as Fidus (fig. 164/165). 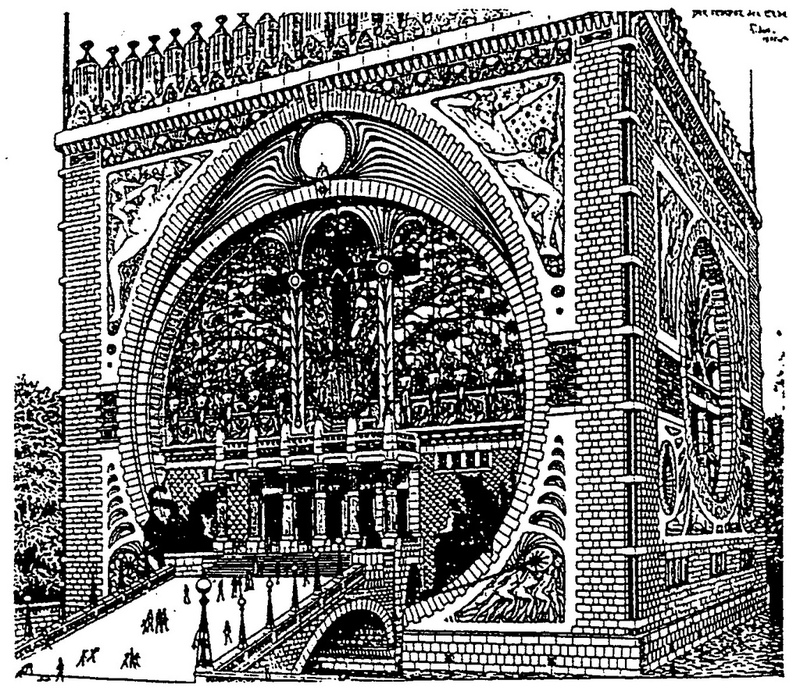 This non-conformist artist designed several theosophical temples, which had obvious references to the Wagnerian spirit and used imagery related to the Freemasons. He wrote in an essay in 1912 that ‘our future temples will be the wonderful expressions of our universal feelings and experiences.’ The ‘Temple of the Earth’ was never built, but its ideas – concocted from Zarathustrian sources, also known to the philosopher Friedrich Nietzsche (1844 – 1900) – are still visible. Fig. 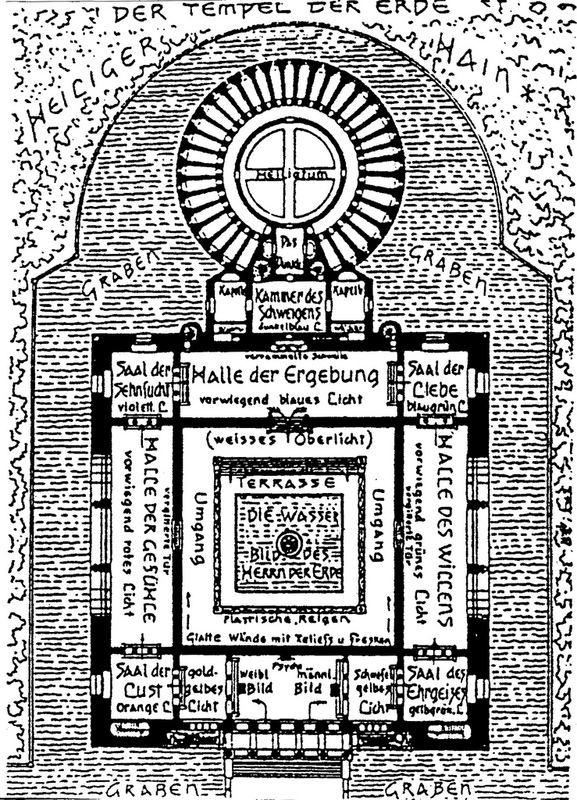 164 – The Temple of the Earth – or ‘Tempel der Erde’ – was conceived by Hugo Hoepner (Fidus) in 1895. He used the idea of the ‘Cube of Zoroaster’ with its emphasis on different types of light. Fig. 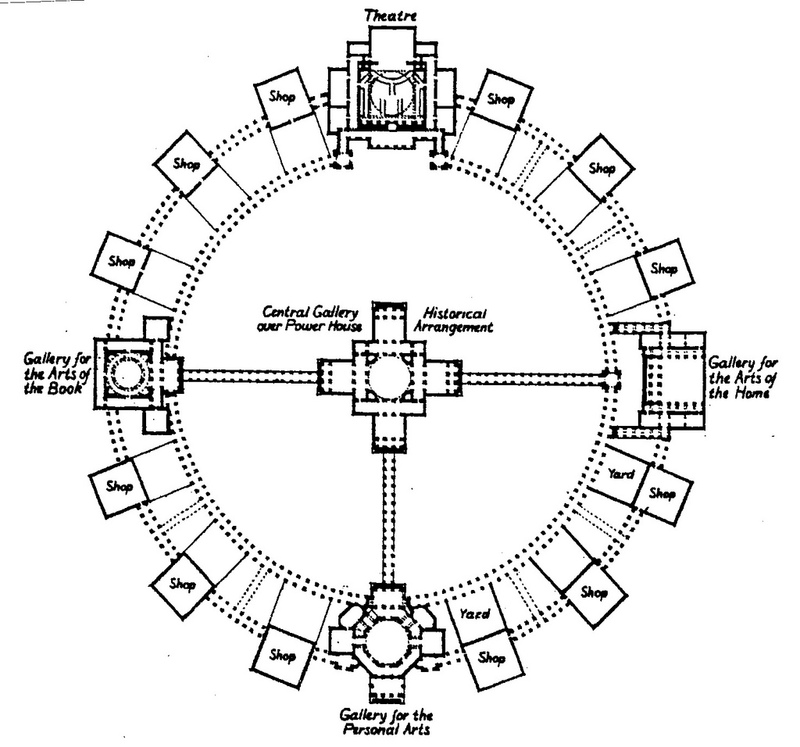 165 – This plan of ‘The Temple of the Earth’ (1895) by Fidus gives the various secular arrangements within the cubic temple. The artist Fidus made Jugendstil-drawings and his most characteristic painting was a canvas called ‘Northern light’, which can be seen as a time document. His ‘free’ spirit was attracted to opposites-in-general and a celebration of extremes. A sympathetic attention for nudism and purification fits into such a state of mind. In 1932 he became a member of the NSDAP, but was not accepted as a Nazi artist. Fidus was a contemporary with the Swiss artist Ferdinand Hodler (1853 – 1918), who was also a representative of the same Zeitgeist. Cultural life in Europe before the First World War (1914 – 1918) was concerned with renewal, vitality and youth (WATKIN, 1977). This same general sense of unrealized and unfulfilled potentiality was present in England when Robert Baden-Powell (1857 – 1941) wrote his ‘Scouting for Boys’ in 1918 and the Boy Scouts’ movement was unofficially founded a year earlier. Hodler’s themes were Swiss landscapes and (self) portraits in a realistic style. He called his characteristic grouping of figures – like his controversial ‘Die Nacht’ (1889/1890, Kunstmuseum Bern) – Parallelism. Later work was focused on love and death – due to the passing away of two loved ones, Augustine Dupin and Valentine Godé-Darel in respectively 1909 and 1915. His retrospective exhibition in Zurich in 1917 was a summa of his entire career (HAUPTMAN, 2007). The beginning of the twentieth century was a time of imagining all sorts of ‘temples’ and other large structures as a tribute to or protest against the Machine Age. The German architect Fritz Schumacher (1869 – 1947) designed a ‘Monument for Nietzsche’ (1898 – 1900), which was called ‘Temple of Life’ (fig. 166). This project was part of his excogitated world-view to create a new and beautiful order. He followed the suggestions of Camillo Sitte (1843 – 1903), the Austrian architect and town planner, who proposed a division of a city along ‘artistic’ lines. Schumacher was pressed to retire in 1933, because the authorities did not like his idealistic views. Fig. 166 – The Temple of Life, designed between 1898 – 1900 by the German architect Fritz Schumacher, was a tribute to the philosopher Friedrich Nietzsche and his ‘Zarathustrian’ ideas. The ‘utopian’ artist Wenzel Hablik (1881 – 1934) contributed his ‘Temple of the City’ (1914) to the expressionist architecture of the early twentieth century. This Czechian-born painter, honored in the Wenzel Hablik Museum in his former townhouse in Itzehoe (north of Hamburg), was concerned with the ideal of a ‘Gesamtkunstwerk’ – treating painting, decorating, furniture and architect as a whole. The ‘Temple of the Arts and Crafts’ (fig. 167) by Charles Robert Ashbee (1863 – 1942) was part of the major ideas of renewal of the city in Great Britain and formed the final chapters of his influential book ‘Where the Great City Stands. A Study in the New Civics’ (1917). Fig. 167 – The ‘Temple of the Arts and Crafts’ by the English architect Charles Robert Ashbee dated from before 1917. The ‘Crafts Museum’ or ‘Art Institute’, in combination with a ‘Creative Guild’, should bring back the spirit of ‘inventing, dreaming and finding the city its soul’ (without the help of modern machinery and related modes of production). Ashbee’s ideas to revitalize the existing cities by individual creativity became known as the ‘Arts & Crafts Movement’. 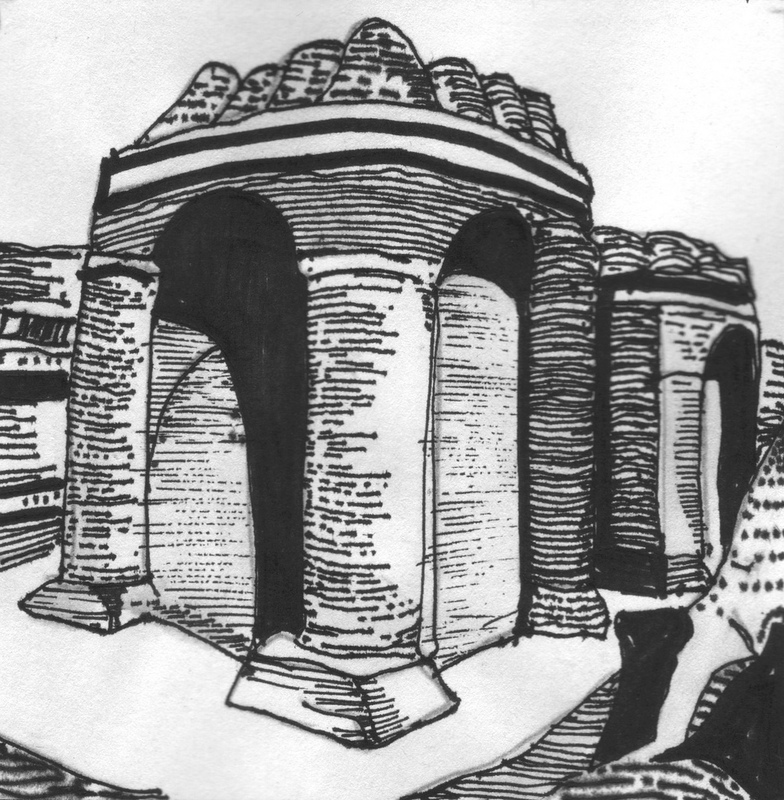 The idea of a ‘temple’ is still – and will probably remain – an essential element in architectonic history. It provides the link between the higher ideals of mankind and their rendering in material visibility. Architects, artists, builders and critics will continue to occupy themselves with the creation, study, implementation and amendment of the eternal human transposition from the invisible to the visible and vice versa. The ‘temple’, in its religious and non-religious disguises, will remain a powerful architectonic expression of the mental border-crossing between certain stages of visibility, not only in the obvious distinctions of an oppositional mind, but also in the wider, quadralectic field of visibility.